As soon as I was old enough to roam around by myself, I was a weekend denizen of the Fayetteville, Arkansas downtown square. I watched most Saturday double features at the Palace Theater, bought fountain cokes at the nearby F.W. Woolworth store, checked the bone structure of my feet in the x-ray machine at Lanier’s shoes, smelled the new tires at Oklahoma Tire and Supply, shopped for gifts at Penny’s, and listened to the latest 45’s at Guisingers Music. Like any person who spent time on the Fayetteville square in the 50s and early 60s, I often ran into Mr. J. D. Eagle, who had his real estate office in the Craven Building. As I remember him, he was a grumpy, intense, white-haired man always neatly dressed in a suit from another era. He usually seemed distracted and in a hurry. During those years, he was well-known as a long-time realtor, active in civic affairs, who had a reputation for being a bit of an eccentric. The context of Eagle’s advertisement is crucial for understanding his motivation for publishing it. On May 17, 1954, the U.S. Supreme Court had issued the Brown v Board of Education of Topeka decision, which ruled that the segregation of schools was unconstitutional. Five days later, on May 22, 1954, the Fayetteville Board of Education announced plans to integrate Fayetteville High School (it was more than ten years later before grade schools were integrated). The story of the peaceful school integration is told well by Andrew Brill in an article entitled “Brown in Fayetteville: Peaceful Southern School Desegregation in 1954,” published in the Arkansas Historical Quarterly (Winter 2006) and in a book Civil Obedience: An Oral History of School Desegregation in Fayetteville, Arkansas, edited by J. L. Adams and T. A. Black (University of Arkansas Press, 1994). As an ardent states’ righter and segregationist, Eagle was adamantly opposed to both the Brown decision and Fayetteville’s action to quickly integrate its high school. It is clear that he published his letter to make his argument against forced integration. Briefly summarized, Eagle's letter, written in a ornate nineteenth century style, is a plea against government interference in racial matters. He wrote, “The Government may make no law that contravenes the economic, social, or religious beliefs of the individual, whose conscious and his God must be the sole arbiters in such matters.” This assertion buttressed his argument that segregation should not be ended by the national government because, in many states, it is based on social beliefs of the majority of people in a state. His calmest argument was that segregation is a choice provided by the U.S. constitution and supported by local ways. He maintained that problems related to segregation would gradually be solved over time, just as -- he asserts -- slavery would have faded away if left alone. When Eagle wrote this article he was about seventy years old and had been living in Fayetteville for around thirty years. He was born John D Eagle (the D is not an abbreviation) on April 5, 1885 in Bellefont, Arkansas (in Boone County, just down Highway 62 from Harrison). He was the son of J.B. and Mattie Walters Eagle. His uncle, James Phillip Eagle, had been an officer in the Confederate army and, after the Civil War, a farmer and Baptist minister; he served as Arkansas’ governor from 1889 to 1893. In the first decade of the 20th century, J.D. Eagle attended the University of Arkansas, then returned to Bellefont, where he became a Realtor. The 1910 census showed that he was living in Bellefont with his parents, and a younger brother (Hugh D.) and older sister (Virginia C). Ten years later, the 1920 census listed him as still living with his parents in Bellefont, working in real estate. At some point when he was living in Bellefont, Eagle married a woman named Marie; they were divorced on December 2, 1925. In 1925, J.D. Eagle moved to Fayetteville, where he started his own real estate firm. The 1930 census shows him living in Fayetteville, married to Mildred R. (she was 26 at the time; he was 44). They were divorced sometime in the 1930s, and Eagle married Ruth Myers. According to his WWII registration (undated, but likely completed in 1940), he and Ruth lived at 24 Duncan Street in Fayetteville and had telephone number 616. They had a son, John Phillip, in February 1941. Eagle had a long career in real estate; his advertisements starting appearing in the local newspapers soon after he arrived in Fayetteville and they continued nearly until his death in 1975. In 1974, he received a 50-year service citation from the Fayetteville Board of Realtors. A man with strong views, Eagle was also attracted to politics. In the 1940s, Eagle became actively involved in the Democratic Party and was elected in 1942 as Committeeman for the 1st Ward, a position he held for several year. In 1948, he bolted the Democratic Party to head the Washington County States’ Rights Democrat Party that had nominated Strom Thurman and Fielding Wright for President and Vice-President. This party was strongly pro-segregation and anti-civil rights. Eagle’s name appears as “Temporary Chairman” on two large display advertisements published by the “Washington County States’ Rights Democrats” in the Northwest Arkansas Times. 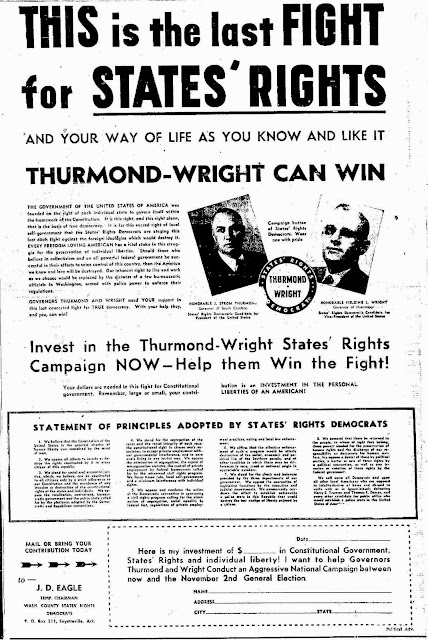 The first ad, dated October 22, 1948, was headed in large letters, “THIS is the last FIGHT for STATES’ RIGHTS and your way of life as you know and like it.” It provided a form to complete and return with a contribution to the presidential campaign. 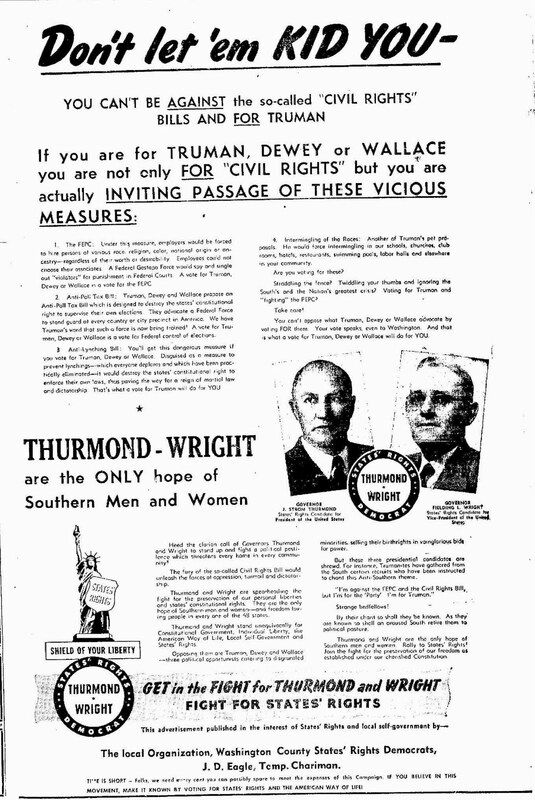 The second ad, dated November 1, 1948, proclaimed, “Thurman-Wright are the ONLY hope of Southern Men and Women,” and stated the party’s opposition to legislation that would end the poll tax, prohibit lynching, promote the intermingling of the races, and end racial discrimination in hiring. The Thurman-Wright ticket got about thirteen percent of the votes cast by Fayetteville residents, coming in third behind Truman, who received about 46% of the vote and Dewey, who got nearly 40%. Statewide, Thurman-Wright garnered 16.5% of the votes for presidential candidates, and Truman received Arkansas’ electoral votes after getting 61.7% of the popular vote. Although Eagle continued to be associated with the States’ Rights Party for a couple of years after the 1948 election, I can find no newspaper or magazine articles that indicate that he again was publicly active in electoral politics. During his fifty years in Fayetteville, Eagle was engaged in many civic organizations in the city; for example, he was a Rotarian for 48 years. Also, he was a long-time member of the local chamber of commerce. His wife, Ruth, was energetically involved in different music, arts, and social groups in Fayetteville over a long span of time. For over three decades, she played the viola and violin at many of the city’s musical events. Both J.D. and Ruth Eagle were active members of the First Baptist Church. J. D. Eagle died on July 14, 1975. He was 90 years old. Coach Glaze Writes a Book!